Novak Djokovic rolls on. Is that what just happened? Yes and no. He did finish off Juan Martin del Potro easily, routinely, Saturday 6-3, 3-6, 6-3, 6-2 to advance to the final 16 at the French Open. They played the final two sets after the match had been stopped because of darkness the night before. But the truth is this: Darkness saved the day for Djokovic. A tale of two days? Moreso, it was a tale of one: Friday. What happened Saturday was expected, as Djokovic is playing to well, too consistently for del Potro, maybe for anyone. Delpo missed a year with wrist surgery, then suffered a small tear in his hip a few weeks ago. He’s not fit yet, not rust-free, not used to Djokovic’ level. Some people are asking if Djokovic is the world’s most dominant athlete. . .in any sport. Maybe so. But on Friday, he was the second best player on the court. He was shaken, he was rattled. The nervous tick on his serve had returned, thanks entirely to del Potro’s pressure. And if it hadn’t been for darkness setting in, Djokovic, still playing great, would have been rolled. Give him credit: He was ready to be great again on Saturday. But the elephant in the room for tennis is this: Del Potro is on the way back, and a healthy del Potro can dominate this game like no one else. Last we saw of him healthy, in the final of the U.S. Open in 2009, he was crushing Roger Federer a day after crushing Rafael Nadal. The general feeling among analysts was that the break after Friday night’s match would favor del Potro. Instead, it saved Djokovic. Del Potro isn’t in shape enough yet to play a grinding five sets. That’s particularly true Djokovic, the most fit player in the world. But del Potro had momentum after that second set Friday. He had found what he needed. Djokovic’ hope was that he could figure something out to stop him (doubtful) or that del Potro would run out of gas (possible). But it was most unlikely that del Potro would return on another day at the same level. He’s just not there yet. Modern Tennis Man is Just About Back. Can Federer, Nadal, Djokovic Hold up? Modern Tennis Man is tall AND nimble. He can run fast AND bend low. He can crush a flat forehand AND (thanks to modern strings) keep it on the court. Forever, tennis has been either/or. They’re AND now for Modern Tennis Man. He arrived in 2009, really, and started revolutionizing the game. Then, he blew out his wrist and went away for a year. Now, Juan Martin del Potro is not fully back, but he did crush No. 4 Robin Soderling, who is having a great year, 6-3, 6-2 Sunday in Miami. “I’m improving faster than what I’m thinking, or then what I expected,’’ del Potro said the other day. “I think I have a difference between me and Rafa (Nadal) or top 10 players at this moment, but is getting closer. This is much bigger than one guy getting his game back. 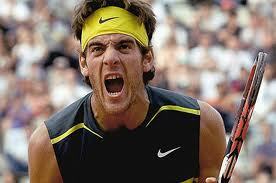 To me, del Potro was the next step in tennis evolution. His injury interrupted that.